Matariki is a time to celebrate Earth, sky, seasons and whānau. This new picture book with its accompanying CD is a treasure for families, schools and pre-schools. Great to read aloud and great to sing along with the CD. Mum, dad, children and grandparents go on a walk and have a picnic. They swim, catch fish, walk through the bush and spend a wonderful day together. Rā, warm us up with your sunshine glow. Papatūānuku, we plant seeds in you. Lots of New Zealand wildlife make guest appearances throughout the story. 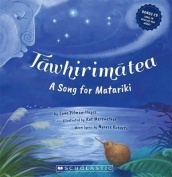 Very good use of Te Reo throughout the story as well as a complete Maori version make this essential for school libraries. Gorgeous use of colour in the illustrations, especially the blues and purples. Warm and friendly.